Fifteen years after producing the first feature based on Mike Mignola’s acclaimed Hellboy comic book series, producers Lawrence Gordon and Lloyd Levin knew the time was right to reimagine the film franchise. The landscape of the horror-action-fantasy genre had changed dramatically in the ensuing decade and a half. Recent big-budget comic-book-based titles demonstrated that moviegoers were ready to embrace flawed superheroes (and antiheroes) and edgier, R-rated storylines. When it came to deciding on a plot, the filmmakers were faced with an embarrassment of riches. Published over more than 20 years, the Hellboy series boasts the most issues under the direction of one person among all currently published comic book series. Ultimately, the producers gravitated to 2010’s Hellboy, Volume 9: The Wild Hunt, an anthology that includes issues #37 to #44 of the series, as the central thread of story. In addition to being an exciting, high-stakes action epic, The Wild Hunt reveals Hellboy’s dramatic origin story. 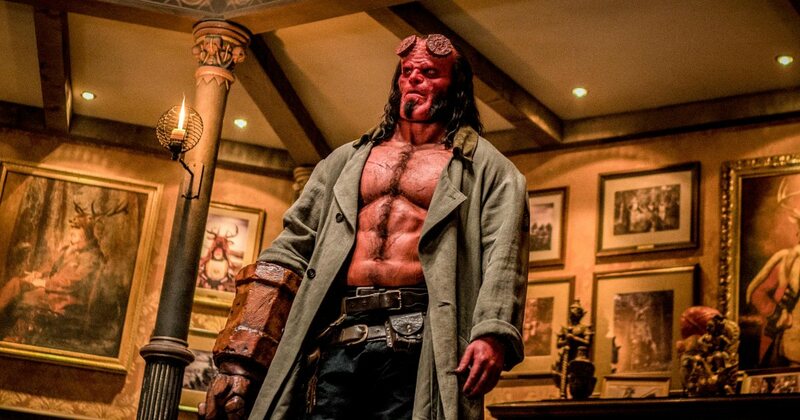 The film also pulls from Mignola’s other books, including a memorable sequence inspired by Hellboy in Mexico, along with some material written specifically for the film. The script is a true collaboration between Mike Mignola and Andrew Cosby. Reading Dracula at ago 12 introduced Mike Mignola (Comicbook Creator/Executive Producer) to Folklore and Victorian Supernatural Literature from which he has still never recovered. He began working as a comic book artist in 1982, working for both Marvel and DC Comics before creating HELLBOY, published by Dark Horse Comics in 1994. What began as a single comic book series would eventually expand to a “Hellboy Universe” of related graphic novels, prose novels, short story anthologies and both animated and live action films. He also wrote and drew The Amazing Screw-On and Other Curious Objects. He has co-written novels with Christopher Golden (Baltimore, or, The Steadfast Tin Soldier and the Vampire) and Thomas Sniegoski (Grim Death and Bill The Electrocuted Criminal), worked with Francis Ford Coppola on Bram Stoker’s Dracula , was a production designer on Disney’s A tlantis: The Lost Empire , and visual consultant to Guillermo del Toro on Blade II , Hellboy and Hellboy II: The Golden Army . Mignola’s comics and graphic novels have earned numerous awards and are published in a great many countries. He lives in Southern California with his wife and a very demanding cat. A prolific screenwriter, producer and comic book creator, Andrew Cosby’s (Screenwriter) career was jump-started in 2001 with his first television series, “Haunted.” This was soon followed by Syfy’s “Eureka,” which ended its five-year run with a record-breaking season in 2012. In 2005, Cosby created his first comic book, Damn Nation , which was immediately set up at Paramount Pictures with Cosby attached to write and produce. Since then, he’s been involved in numerous other feature film projects and even founded the award-winning BOOM! Studios, which has since gone on to become the sixth largest comic book publisher, producing Universal Pictures’ 2 Guns based on their graphic novel. Currently, Cosby is launching a number of new series and film projects, including an animated series for Netflix. He also sits on the board of the world’s first fan-owned entertainment company, Legion M, and serves as Head of Creative for a major motion picture production, distribution and acquisition fund. Mignola remained involved in the process throughout, reading each successive draft to ensure the screenwriter stayed true to the character. Mignola’s involvement was especially important because while many of the scenes and much of the dialogue comes directly from the comic books, Hellboy is an amalgam of the series’ storylines rather than a direct adaptation of one of the books. Going Dark To fulfill their goal of bringing Hellboy into the present day and giving it a more horror-centric, R-rated sensibility, the producers knew they needed a director with the right mix of serious genre chops and the experience to oversee a production teeming with spectacular characters, interwoven plotlines and big action set pieces. “We wanted a director who could handle both horror and action, and also be strong with character — in particular, that dry, near-gallows humor that often comes out of Hellboy,” says Levin. With its rich mythology, compelling storyline and spectacular visuals, Hellboy evokes a wide range of thoughts and emotions for the members of the cast and crew. When it came to casting an actor with the depth, humor and sheer physical presence to play the outsized title character, the filmmakers were unanimous in choosing David Harbour.